So I really got into Hot Wheels a few years ago when my first son was born. It has been a great hobby that is fun for me and my son. 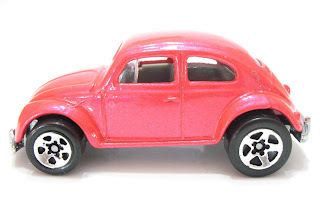 I recently had a daughter born and started keeping my eyes open for pink cars. There aren't tons, but a visit to ebay can net you quite a few, and every once in a while a new one will show up on the racks at the stores. I've began compiling a list of all the pink Hot Wheels. 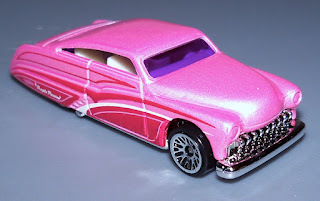 I've tried to stay away from flat out purple (which is also another great color for that little princess Hot Wheeler) but some of these cars are a pinkish-purple. I'm sure this list is not complete, but I'll continue to add cars to the list as I come across them. Ok, enough talk, here we go! 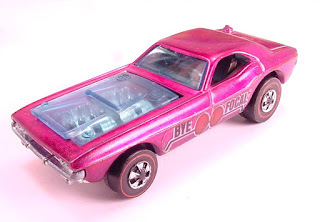 This is a Bye-Focal from the 1972 Hot Wheels series.This early Redline model has great color and smooth lines. A great looking car! This is a '70 Plymouth AAR Cuda. It was one of the 2009 new models. 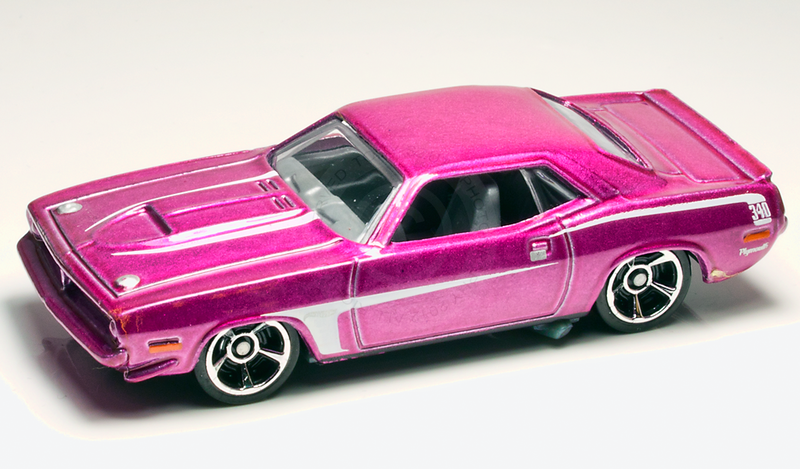 Here is the '70 Plymouth AAR Cuda from the 2011 Street Beasts series. This is the Simpson's Family Car. It was part of the HW City Tooned series in 2015. Here is the 1991 Shadow Jet. It was from the Heros on Hot Wheels series. 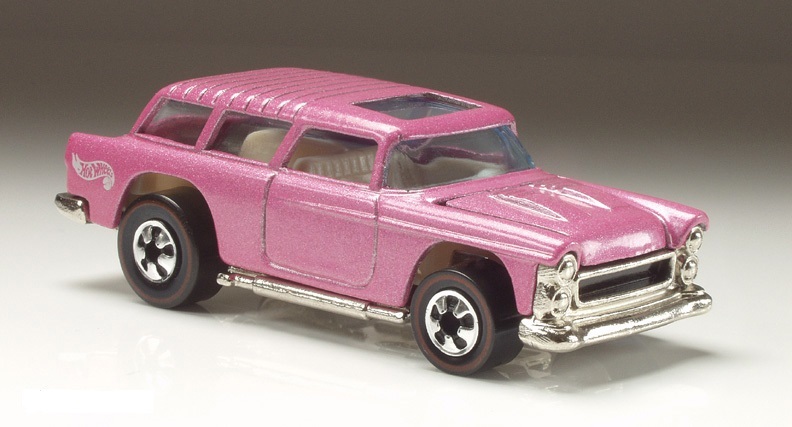 Here is the '35 Classic Caddy from the 1989 Hot Wheels Classics series. It's not all pink, but a nice looking car that sparkles and has pink on it. Next we have the '59 Cadillac Funny Car from the 2009 Hot Wheels Classics series. 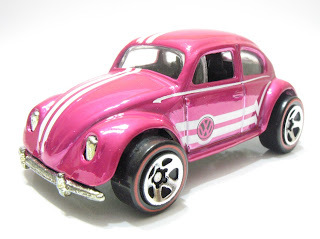 This car is more of a pinkish-purple, but still pretty sweet! This is the Classic Nomad from the 1970 series. Notice those redline wheels. Love it! Next up is another Classic Nomad. This is from the 1993 Vintage Series 8-pack. Here is another Classic Nomad, this one coming from the 1993 25th Anniversary Series. 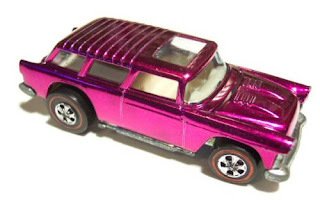 Then there is this Classic Nomad from the 2005 Hot Wheels Classics series. This is Combat Medic from the 2012 Hot Wheels City Works series. 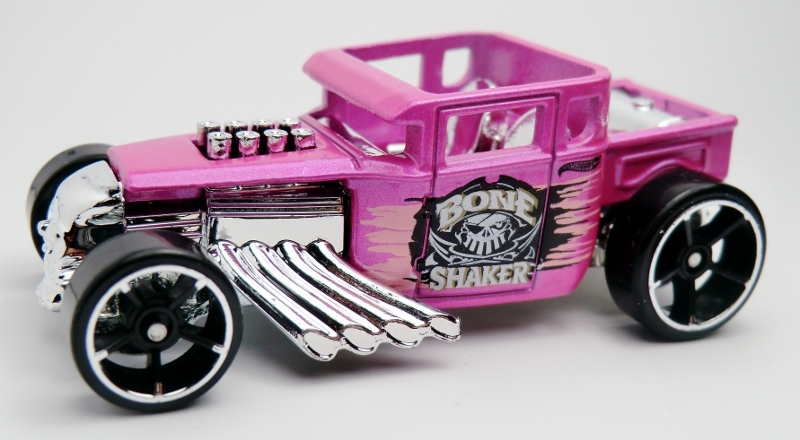 Here is Bone Shaker from the 2007 Hot Wheels Classics series. 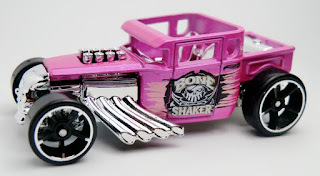 Up next is a Bone Shaker from the 2013 Hot Wheels Showroom American Turbo Series. This sweet looking ride is T-Bucket from the 2013 Cool Classics series. 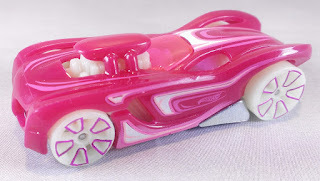 This car is 16 Angels from the 2015 Hot Wheels Race Night Storm series. 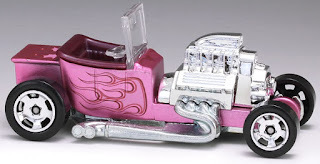 This is Flashfire from the 1993 Heroes on Hot Wheels series. 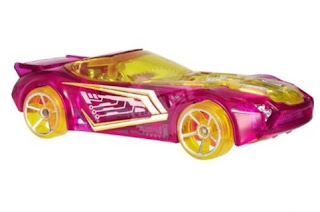 Here is another Flashfire, this one from the 1993 25 Anniversary Dream Car 5-Pack. 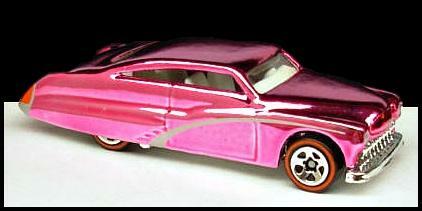 This '47 Chevy Fleetline is from the 2014 Cool Classics series. This is the 3 window '34 from the 1993 series. It's not all pink, but sure looks good. Then there is this 3 window '34 from the 1996 series. A couple of variations were found in 5-packs. Here is a '68 Mercury Cougar from the 2005 Hot Wheels Classics series. Here is another '68 Mercury Cougar from the 2008 Hot Wheels Classics Series. This is the '68 Mercury Cougar from the 2009 Larry's Garage series. The next car is Purple Passion. Don't let the name fool you. Quite a few versions came out in pink. The first one was from the 1994 Hot Wheels Custom Rods series. Here is another Purple Passion...or should we say "Pink Passion"...from 2002. How about this Purple Passion from the 2007 Hot Wheels Classics series. Can you say Pretty in Pink? 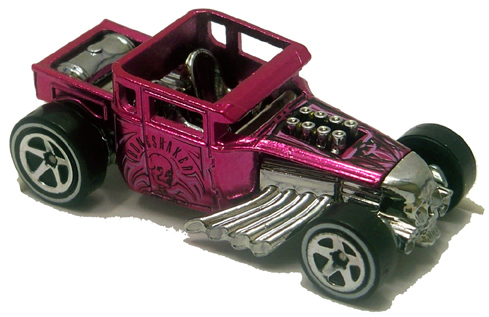 Here is another Purple Passion from the 2009 Larry's Garage series. This is a Purple Passion from the 2010 Mainline Mystery series. This is a '62 Corvette from the 2009 Hot Wheels Classics series. Here's another '62 Corvette from the 2011 Cars of the Decades series. This is a '67 Pontiac Firebird 400 from the 2012 Muscle Mania-GM series. 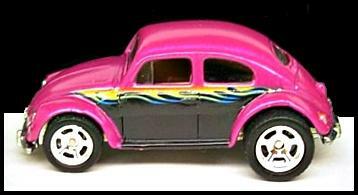 Here is a VW Bug from the 1995 Pearl Driver Series. And another VW Bug from 2003. Check out this VW Bug from the 2005 Classic Series. Here is a Nerve Hammer from the 2014 Hot Wheels Race - X-Raycers Series. 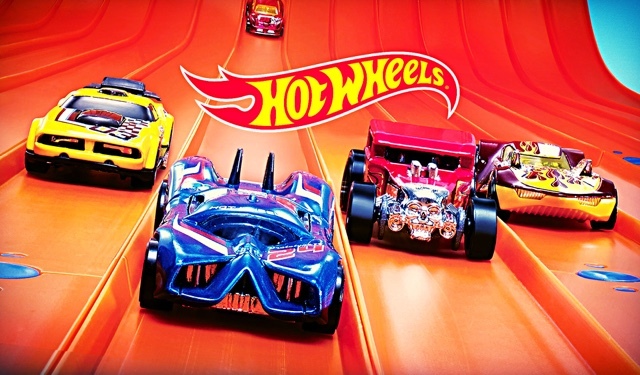 The Southern Utah Hot Wheels Holiday Rip 'n' Race was raced on an 18 foot 4 lane track. Twenty-four cars were put into 6 groups of 4. Each group will race each other 4 times, once in each lane. Points are awarded for place in each race. A 1st place finish receives 4 points. A 2nd place finish receives 3 points. A 3rd place finish receives 2 points. And 1 point is awarded for a 4th place finish. The top two cars in each group move on to the next round. Round 1 provided some great racing! I especially enjoyed DS Racing’s come from behind victory in race 1 of group 6. Group 6 had 3 different cars with a first place finish with The Undertaker finishing first twice. Group 2 had some great racing with Team Gigantor pulling off a big win in race 3, but CC’s Riders’ Corvette looked very strong throughout. Groups 1, 3, 4, and 5 saw undefeated champions with G-Force Racing’s Invader, TS Racing’s Bullet Proof, DC Racing’s Clear Speeder, and Rhino Racing’s Nissan Skyline Redline. Groups 2 and 4 needed a tie-breaker race to determine the #2 car to advance from those groups. When the dust all settled the following teams advanced. H&J Racing’s Winning Formula came out victorious and became the last car to make round 2. So the groups are set. Round 2 saw some more great action. 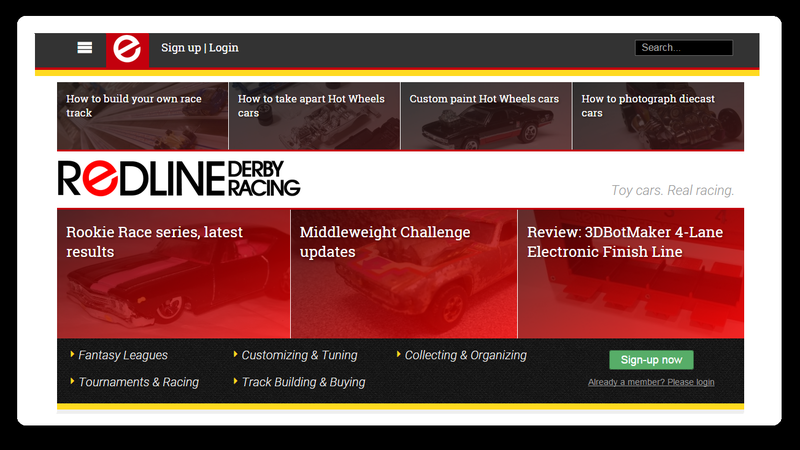 G-Force Racing, Rhino Racing, and DC Racing still remain undefeated. TS Racing and CC’s Riders traded wins in Group 3 with the best race of the night coming in Race 4. When all was said and done, the following cars advanced to the Semi-Finals. G-Force Racing and Rhino Racing continued to show their dominance in the Semi-finals, each sweeping their groups. DC Racing has had a strong showing and Gigantor just seems to get faster and faster as the rounds go on. This is shaping up to be a great final.